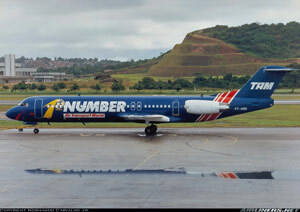 TAM 402 was a regular morning flight from Congonhas Airport in Sao Paulo, Brazil, to Rio de Janeiro. As the engines were accelerated for takeoff the pilots received an alert that the autothrottle had disconnected, a very minor problem that would not affect takeoff, so they elected to proceed. At liftoff, the right engine thrust lever snapped to idle. The pilots were confused, thinking they had an autothrottle problem, then became occupied with trying to force the thrust lever up to maximum, and to switch off the autothrottle control switches. Investigators determined that the actual problem was the probable cause of the accident: the right thrust reverser had unlocked and deployed, without annunciation, due to electrical failures in its locking and warning systems. The thrust lever was properly retarding by itself, but was forced forward a total of three times by the crew. The final throttle advance caused the failure of a safety linkage that the pilots did not know existed, allowing the engine to run up to maximum thrust while its reverser was deployed, and unable to stow. The captain was able to briefly hold the airplane in a slight right bank while losing airspeed, not climbing, with both engines indicating maximum thrust. The airplane stalled, rolled past 90 degrees against full control inputs, clipped a building, crashed into a neighborhood, and burned. Impact was 25 seconds after liftoff, 0.8 NM from the end of the runway. Everyone aboard (89 passengers, two pilots and four cabin crew) died along with four people on the ground. The impact and fire also destroyed the airplane and eight homes.